Ramco has a long and distinguished history in engineering and constructing heavy duty “workhorse” parts washers and systems for bus and rail overhaul facilities. 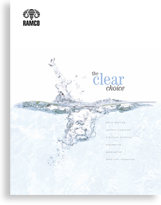 The case history below is one of many Ramco systems within the MTA, New Jersey Transit and LIRR. It was built in 1998 for a major overhaul shop of the New York City Transit Authority. 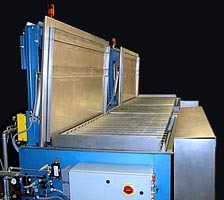 The function is for aqueous degreasing and cleaning of a wide variety of truck componenets before disassembly/inspection and prior to reassembly. 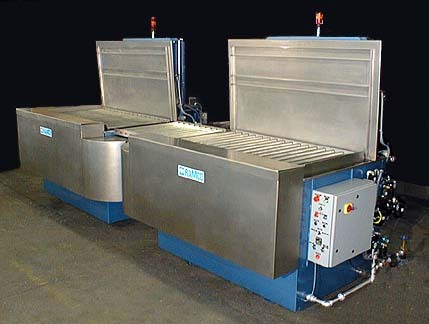 The system consists of two large parts washers that can process up to 70″ long x 36″ wide parts with a gross weight of 2000 pounds. Each station is equipped with a controlled motion elevator to automatically transport the workload into solution, wash or rinse using platform oscillation and return the work to the original loading position. The wash station includes an Oil Decant System with SurfaceSweep (shown below to the right) and a Super Turbo/Filter. 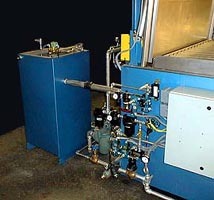 An automatic opening/closing cover and a lip vent exhaust system (shown above and to the left) are included on each station. They are integrated with the transport elevator to energize the exhaust system when the cover opens and shut the exhaust off when the cover closes. Other features include audible horn and visual stack light signals, Nema 4 control panels with lockout-tagout disconnect switch and platform roller conveyors to facilitate transfer between stations.